Old Reds are our visitors this Saturday making their second visit to Roundstone Lane for a National League 2 South fixture. 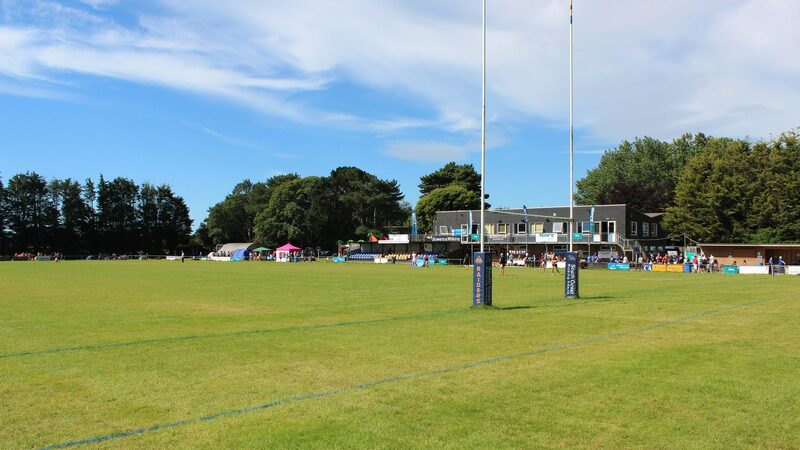 Raiders travelled to their Scotland Lane base in Brislington, Bristol last December returning defeated 33-22 in a tight encounter, played in difficult windy conditions. The club was founded in 1918 (a couple of years before ourselves) to cater for the former pupils of Redcliffe Boys School. The founders were former pupils returning from WW1. From the outset the club had an open door policy and was not exclusively for old boys. The home fixtures were played at the School ground, Daventry Road, in Knowle until 1968 when the fields were developed into school buildings. At that time the club moved to the present site in Scotland Lane. The original school was founded in 1571, although it merged with Temple Colston’s school in 1969, creating the co-educational St Mary Redcliffe & Temple School. The rugby club was successful in the pre-professional days with probably their ‘purple patch’ on the playing front occurring during the early 1980s. They won the prestigious Bristol Combination Cup as well as the Somerset Senior Cup a couple of times during this period. The latter trophy gained the club entry into the National ‘John Player’ Cup competition. Once official leagues were introduced the club settled in Somerset Premier (L8), eventually gaining promotions (and the occasional relegation) within the Regional leagues. In 2016-17 they were Champions of the South West Region thereby gaining promotion to National 2 South. The club won the National Intermediate Cup in 2009-10, the final being held at Twickenham. ORs turn out 3 senior sides on Saturdays with Junior and Mini rugby taking over on Sundays. Old Redcliffians is a proper community club, like ourselves, and rightly takes great pride in the success of their junior section, with many participants graduating through to the senior teams. British Lion prop forward the great Gareth Chilcott (Bath) and up and coming young prop Ellis Genge (now with Leicester Lions) both emerged via their junior section. Club Colours: Red and Black hooped jerseys, red shorts & stockings. Worthing: Coulson C, Forrest J, O’Connor M, Stappers L(capt), Baker S, Coackley P, Clarke T, Baker P, Grantham-Hill N, Hornby R, Vincent B, Herbert P, Stoner S, Bateman L, Lamprey C.
Reps: Matthews D, Purdy S. Scorers: T:Stappers (70m):C: Coakley. Old Reds: Gaddes M, Jones G, Lancastle S, Woodward T, Palmer A, King G, Haigh P, Short N, Cotton M, Fry M (capt), Barry D, De’Scossa N, Wheatley J, Excell S, Taylor P. Reps: (from) Yandell R, Bond P, Luker G, Greenway P.
Scorers: T: Lancastle(39m), Palmer(60m), Excell(72m)C: Gaddes(39&60)P: Gaddes(1m&40m). The match was played in very difficult weather conditions caused by hurricane ‘Deirdre’, with gusty winds, gale force at points, and squally showers. The visitors had the use of the slope in the first half, with pundits correctly thinking that 15-17 at oranges was not enough leeway. Despite the conditions both teams played good rugby with the home side making the best of the conditions for a deserved bonus point victory. Old Reds: Owen, Bird, Gervais, Jones, Boxall, Hill, Sprague, McGrath, Ward, Caulfield, FryD, Pursall, Parsons, Coster, Doyle. Bench: Harvey, Gompels, Zindi, Wiltshire, Hall. Scorers:T: Bird (5), Hill (34), Parsons (51), Jones (79) C:Hill x2 (34 &79) P:Hill x3 (32, 60,78) . Raiders: McLean, Maslen, Sims, Richards, Barnes, ForrestJ, Walsh, Birch, Luke, Adams, Dingle, Lee, Lake, Whittall, Cuffe. Bench: Gibson, Sassone, Dawe, Holt, Barlow. As usual a list of players used in the previous fixture against Taunton is provided along with a little more detail as to their credentials. Most of the players listed have played against Raiders before. Henry Bird (wing) who missed the Titans’ fixture is league top try scorer with 24. Keiran Hill, who also missed the Titans’ match, is top points scorer with 178. Back-row forward Dan Fry has featured in every match. With both teams locked on 53 points and hovering above the relegation zone this fixture has special significance. It really goes without saying that your vocal support on the touchline will be much appreciated by the boys to add the 16th man to get them over the line!!! Christian Gervais* 28 22 46 2015 2T Glos Centre: Ding’s*56, Taunton*71. Craig McGrath* 35 11/5R 35 2013 – LH Prop: Clifton 4, Bristol 15, Bridgwater* 26, Newbury 26, London Scots 18, Barking 5, Rosslyn Park 16. Henry Bird* 29 24 47 2014 24T 23rd Mar Full Back: Cinderford 3, Bristol 7s.